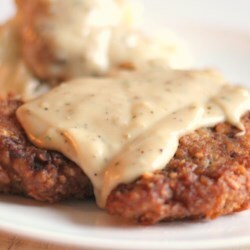 My middle son loves chicken fried steak and so do I. He came back for seconds with this recipe. I had to change it a little. Because I'm in the Denver area, frying can be a problem - things get overdone on the outside while undercooked inside. So as soon as the outsides were done, I put them in the oven like shake-and-bake for about 1/2 hour. Also, IMHO, a touch of garlic immensely improves country gravy, so I added garlic powder to the gravy. I also couldn't find uncultured buttermilk, but regular milk worked fine.